Yahya bin Said al-Jabri, Chairman of A\' Duqm Special Economic Zone today sponsored in the VIP Terminal at Muscat International Airport the celebration organized by Oman Air to launch the direct air route between Muscat and Ja\'aloni airport in the Al Wusta Governorate. The Chairman of A\' Duqm Special Economic Zone said that the launch of this route comes within the continuous cooperation and coordination between the A\'Duqm Special Economic Zone Authority and the other state bodies to develop A\'Duqm. He pointed out that the air route will contribute to connecting the Al Wusta Governorate, which includes a number of wilayats in the middle of the Sultanate with the rest regions in the Sultanate. Citizens, businessmen and investors can now cut short the distance and reach the governorate through Ja\'aloni airport and vice versa in a record time; nearly one and half hour by air compared to land travel which takes up to 6 hours. He pointed out that Oman Air will operate three flights weekly to Ja\'aloni Airport. Al-Jabri pointed out that the integration between the social development and infrastructure, which His Majesty Sultan Qaboos Bin Said is keen to achieve, is very clear in such steps and projects because the air routes and flights usually cut short distances, time, effort and money. He added that the launch of this air route is an added value to the steps taken to enhance and develop the infrastructure of the region and will be followed by other steps. The air route will serve all sectors of society and contribute to expediting the infrastructure for the A\'Duqm Special Economic Zone and other wilayats in the Al Wusta Governorate. While the route has an indirect impact on the tourism, investment and industry sectors, it has positive direct impact on the citizens of the Al Wusta Governorate and all those whose businesses and interests are connected to it. On his part, Wayne Pearce, the CEO of Oman Air expressed his joy for launching the new service between Muscat and Ja\'aloni which coincides with the 42nd National Day celebrations. He pointed out that the route will give momentum to the economic development in the region which is witnessing major leap. He added that providing this route affirms Oman Air\'s commitment and constant efforts to enhance development and prosperity at the various parts of the Sultanate. It is also a vital step in terms of expanding the local destinations network, which witness constant growth due to preparations of a number of new airports. He explained that the operation of the route came after Oman Air and the A\'Duqm Special Economic Zone Authority reached an agreement that will contribute to enhancing the investment operation in this important economic zone. 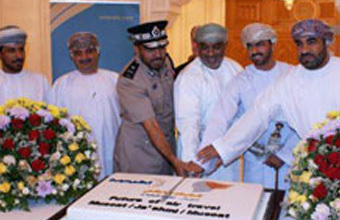 The ceremony was attended by Dr. Ahmed bin Mohammed al- Futaisi, Minister of Transport and Communications, Sheikh Midhad bin Mohammed al-Yaqoubi, Governor of the Al Wusta Region, Maj. Gen Salim bin Musallam Qattan, Assistant Inspector General of Police and Customs, Hamoud bin Mohammed al-Harsosi, representative of the wilayat of Haima in A\'Shura and a number of state officials, ROP officers and representatives of the private sector, travel and tour agencies.